A month or two ago on Craigslist I stumbled upon somebody selling the Infinity/Monster Lite Rogue Monolift Attachment; the version that’s compatible with my rack. I wasn’t really in the market for a Monolift and I wouldn’t go so far as to say I needed a Monolift, but they were in perfect condition and being sold for about half the price of new. Honestly it felt foolish not to buy them at that price, so I did. In this short article I’ll discuss the basics of the Monolift, and my take on Rogue’s version of the Mono attachment. I realize this isn’t the newest of products to review but it is a popular product that is still in-demand to this day, so why not, right? 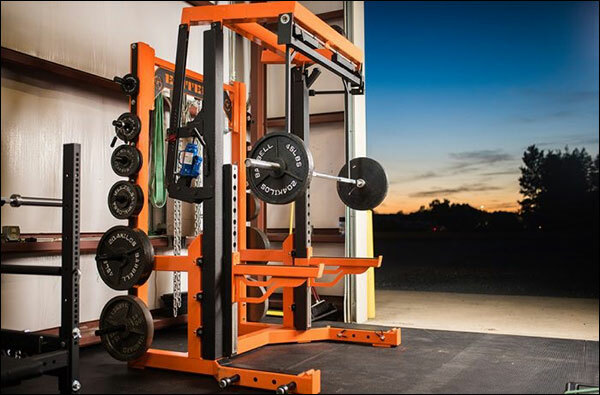 For those who don’t know, the free-standing Monolift is an unique style of rack designed for the safe execution of maximum-effort squats. 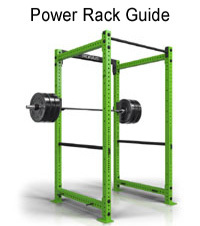 Most Monolifts have all of the same standard storage and safety features of a normal power rack, but the true benefit of these expensive monstrosities is that they eliminates the walk-out phase of the squat. When you un-rack a loaded barbell in a Monolift, the hooks that hold the bar retract so that you can squat where you’re already standing; no need to back away from the rack. As you finish the set, the hooks are swung back into their original position under the bar allowing you to easily re-rack it; again without taking any steps. The elimination of the walk-out along with safety spotters make the Monolift just about the safest way to overload on the squat. The drawback of the Monolift Rack is that it requires a spotter to work the retracting hooks, so it’s a fairly useless device if you’re training alone. That is to say, it’s just a normal power rack when training alone. It’s also horrendously expensive; Anywhere from $3500-$5500. Rogue’s Monolift Attachment accomplishes the same basic thing in that it allows us to skip the walk-out when squatting heavy, and it does this not only for a hell of a lot less cash, but without the need of a spotter. 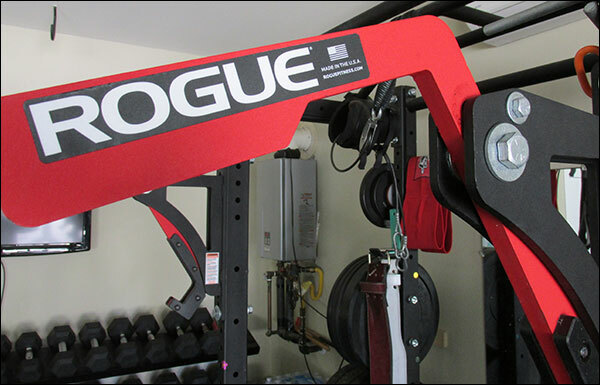 The arms of the Rogue Monolift are balanced in such a way that when there is no longer a bar hanging in the hooks, the arms swing back and out of the way. This allows you to squat in the same place as you lifted off; no walk-out. You do have to move forward 4″ to get the barbell back into the hooks when you finish the set, but that still doesn’t require you to take any steps. Another advantage to the attachment over the stand-alone Mono is that it can be used for a number of other lifts. Many folks really seem to dig benching with their Mono as it removes the lift-off much the same way it removes a walk-out with the squat. 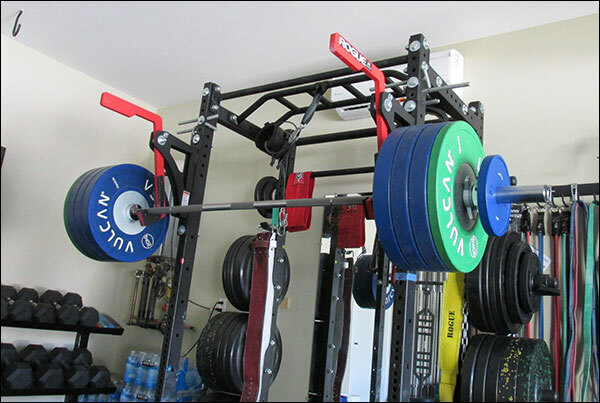 The Monolift Attachment is a fantastic rack accessory, and it’s more than adequate for most commercial and garage gyms. 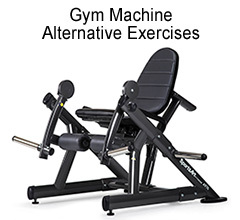 The number of gyms that need to or even want to invest in a stand-alone Monolift is pretty small, so the fact that you can add this feature for about $300 rather than several thousand is just awesome. The red and black colorway makes your rack pop. 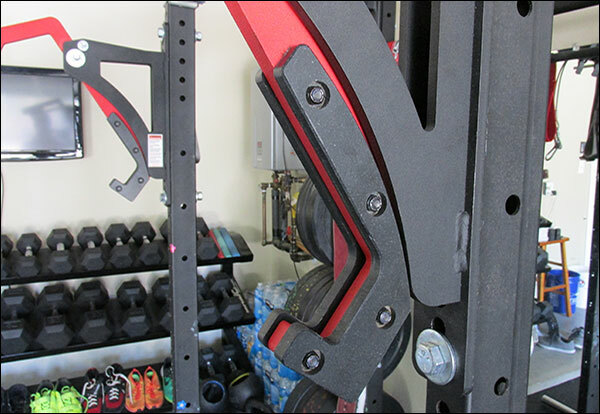 Rogue didn’t invent the Monolift attachment, but they made it cooler looking and they made it to fit nearly any rack. There is a model designed for their Infinity and Monster Lite units; both of which use 5/8″ hardware, and there is a model designed exclusively for the Monster racks and their 1″ hardware. In addition to that there is both a bolt-on version and a drop-in adjustable version for both attachment models. 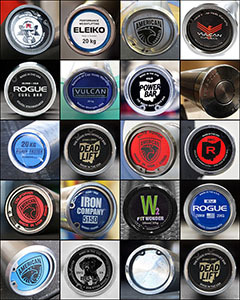 In terms of functionality, Rogue’s Monolift Attachments do exactly what they are designed to do, and they do it well. The arms are well-balanced, the UHMW covers the entire hook and then some (so there is no chance for bar damage from metal-on-metal contact), and the hook opening is of such a shape that getting the bar safely back into position is simple. All-in-all, these are nicely done, and completely unrivaled. Rogue’s Mono Attachments have plenty of UHMW plastic. When it comes to price, Rogue’s Mono Attachments start at $275 and $295 for the bolt-on versions, and it’s $30 more for the adjustables. These may seem a little pricey, but consider that it costs many thousands of dollars for an actual monolift, and an actual monolift is good for nothing else despite it’s near 30-square foot space requirement. $300 is not a bad price at all to be able to really load up at home and completely eliminate the walk-out. You’ll still have your spotters, so in terms of safety this is the way to go. My only grip with my Rogue Mono Attachment is that I don’t have the adjustable version. I can’t really complain considering how little I paid for mine, but the fact remains that they get used much less than they would get used if they were adjustable. Why? Because I’m not the only one who uses the rack, but I am the only one who can use them at the height I set them at. If I want to use them I have to grab the wrench and ratchet and attach them, and when I am done I have to grab the tools again to detach them. Truth be told, I don’t bother unless I’m at the end of a cycle lifting 100%. I highly recommend this product if you lift the kind of weight that warrants owning them, but I also strongly recommend you pay the $30 extra for the adjustables; they are just easier to move around. 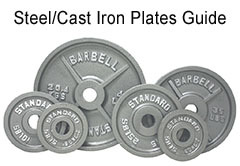 Even if you are the only one who uses your power rack, you still may want to move them around between the bench and squat, or maybe get them out of the way of your J-cups for other lifts. It’s totally worth the $30; believe me. 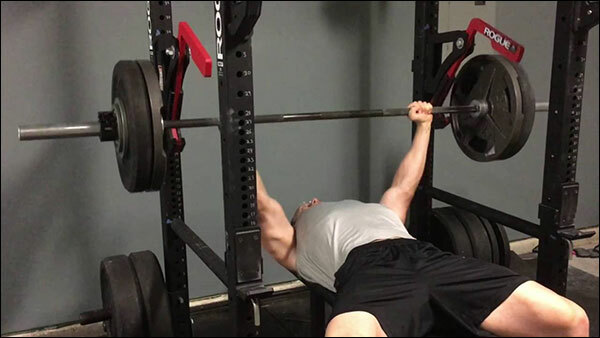 You may also want to give the Mono Attachment some serious consideration if you’re one of those people who gets shoulder irritation from the bench press lift-off. 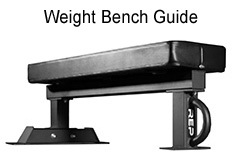 There is more than one review of this product out there in which the customer was just ecstatic about using the Mono for the bench for this very reason. 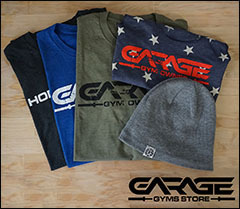 All-in-all, great product. Sure it already existed, but take a look at some of the older Mono attachments out there and tell me that these aren’t superior in every way. Note: If you purchase this product, make sure you choose the right model for your rack. Thanks for the review. This is a product that I didn’t know existed and now I need it in my life. This sounds perfect for bench pressing alone in my garage. Just FYI, the Infinity “adapter” is totally unnecessary. A 1/2″ thick piece of rubber in the crook of the upright-hugging “arm” will do it, or just the pin will do it (even more simply). Agreed that the adjustables are the way to go since they’re simple to swap lower for benching, and that “hand-off” can save the occasional pec or shoulder tweak. I managed to have 175kg hanging off of one Monolift arm when I missed one of the two hooks, and the arm held the loaded, collared barbell and plates aloft. These things are seriously overbuilt. About the only thing I had to fix once I realized what was going on was to bump the other side from below and then *very slightly* bend the arm back. The entire spectacle was further evidence as to why Rogue costs a little more. I sure as hell wouldn’t buy a product like this from, say, Titan (imported pig iron). Bob you have no idea how bad I want to say “don’t buy Titan” in every post. I’m scared for the stronger lifters who go that cheap route. I don’t ever say it because I don’t want to turn anyone on to the brand who didn’t already know about them. I’ve heard that about the Infinity retrofit, and I’m sure you could wedge just about anything in there. I left that DIY fix alone since I didn’t have that version to test… just in the interest of being responsible and all. I’m curious if anyone knows if I can attach the rogue monolift to the Vulcan 3×3 power rack? If you have a rack with 5/8″ holes that are 2″ apart, then that should not be a problem. Just make sure the 2″ holes run the entire length of the rack because the two bolt holes are actually like 12-14″ apart or something like that.